Top o' the morning to you! Though I can really only lay claim to a wee drop of Irish blood on my mother's side, there's still a part of me that enjoys taking part in the St. Patty's Day celebration of all things Irish. 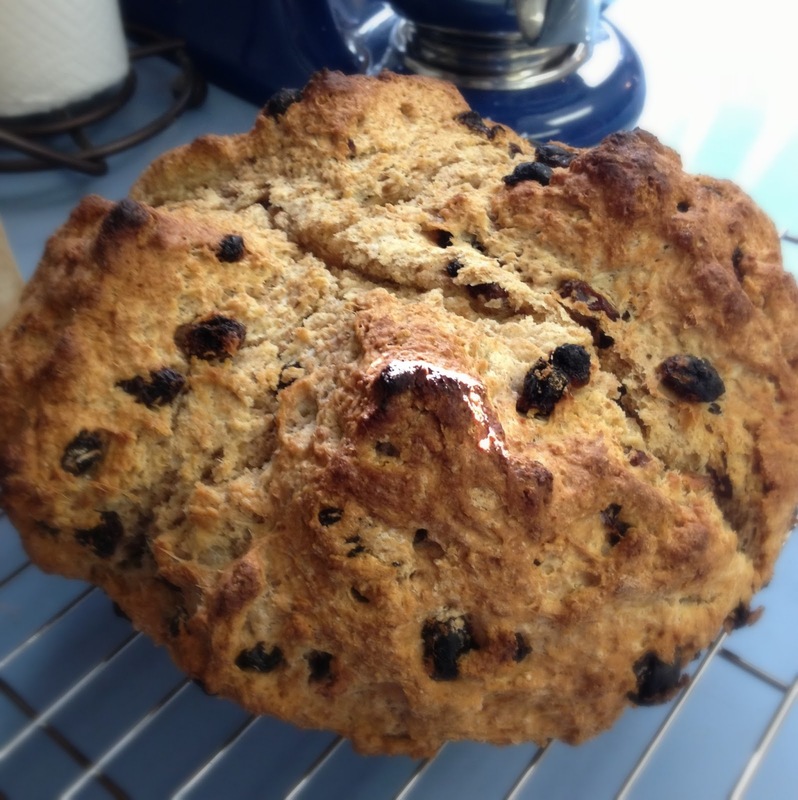 I don't typically do much in the way of traditional Irish cooking, but I am intrigued by it.One recipe I knew I wanted to try was soda bread, which derives its name from the baking soda used as leavening. I had never tried soda bread, but it is wonderful! 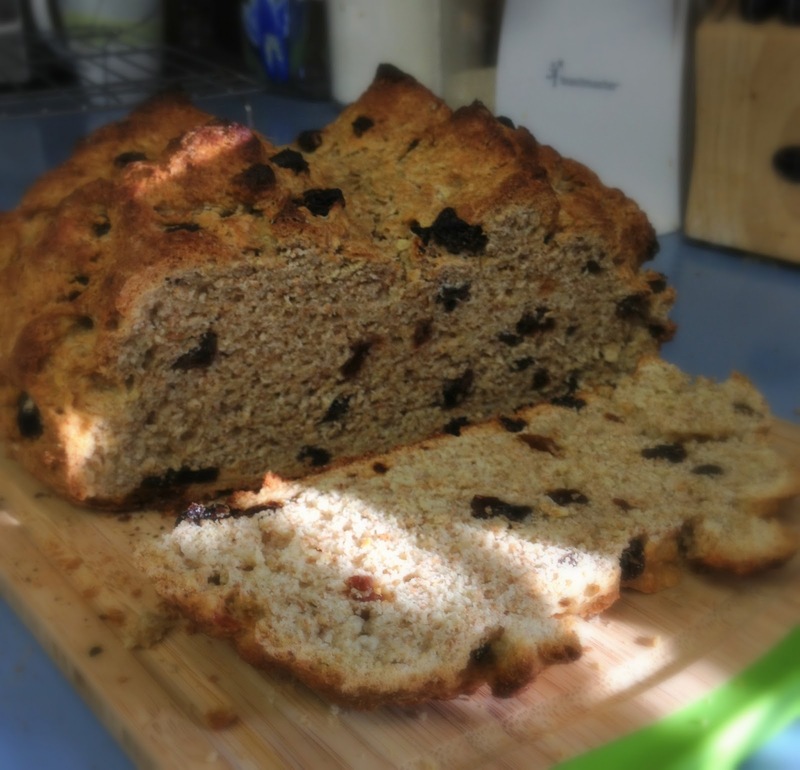 A sturdy quick bread, slightly sweet with a hearty whole wheat flavor and studded with juicy raisins, it only took me a few minutes to pop it into the oven. I love the rustic looking craggy crust, the crunchy exterior and the soft and chewy inside. It is delicious warm with butter, and I'm sure it would be great toasted, cold, or as a fantastic accompaniment to some good ol' Irish stew! Preheat oven to 425. Lightly grease cast iron skillet or baking pan. In a large bowl, mix flours, sugar, salt and baking soda. Cut in butter with a pastry cutter or criss-crossed knives until mixture resembles coarse meal. Stir in raisins. Make a well in the center of flour mixture. Pour in egg and buttermilk and mix with a wooden spoon until dough becomes too stiff to mix. Coat hands with flour and knead dough in bowl just until it forms a rough ball. 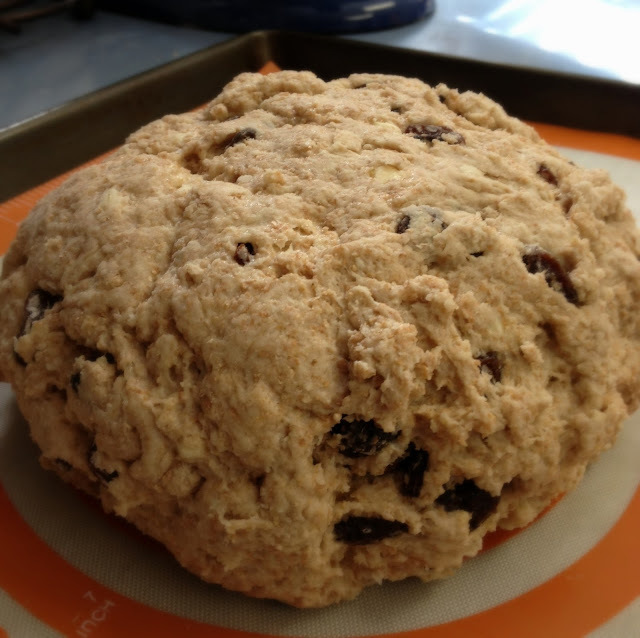 Transfer dough to pan or skillet and shape into a round loaf. Using a serrated knife, make a deep "X" in the top of the loaf. Bake 35-40 min. or until loaf is deeply browned and bottom sounds hollow when tapped with a knife. Serve bread warm, at room temp., or toasted with butter or cream cheese.